Stand out from the rest with a colorful design to recognize your top performers. Available in 3 sizes. Additional $10 set-up fee applies for full color design creation. Note: Only one set-up fee per award type, not per piece. Allowed types: jpg, jpeg, pdf, eps, ai, psd, svg, cdr. Did you order this for someone and they loved it? Share your experience! 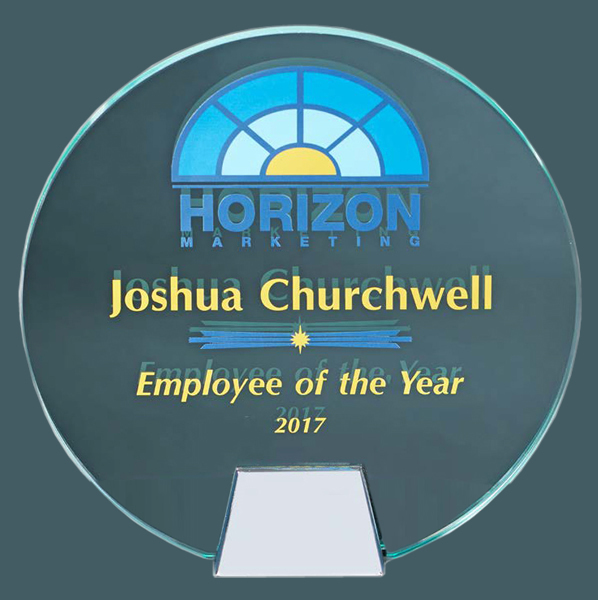 We use Awards4U on a regular basis for our service awards and retirement gifts. They are absolutely amazing! Everyone on the staff is friendly and helpful whether it's over the phone or in-store. Even with very large orders with many items, they make the process easy and painless, they pay attention to every detail, which in turn makes my job so much easier when I know I don't have to worry about any errors being made. We have never received one item from them that was broken or the engraving was misspelled or anything like that. Their turnaround time is amazing, prices are great, and they're always willing to go the extra mile to help in any way. I have used Awards4U for many years and I cant say enough about the experience. The customer service they provide is second to none and their pricing is exactly what I need for the projects they turn for us. There showroom is great and you can see the quality in the products they use. There are places online that provide similar products sometimes, but you can't talk to people and when things get screwed up online, you have no recourse. Save yourself the trouble and headache and use Awards4U. Sales person was excellent. Found the previous order record and booked the new order.